11th Floor Ocean/Diamond Head View Waikiki Condo. 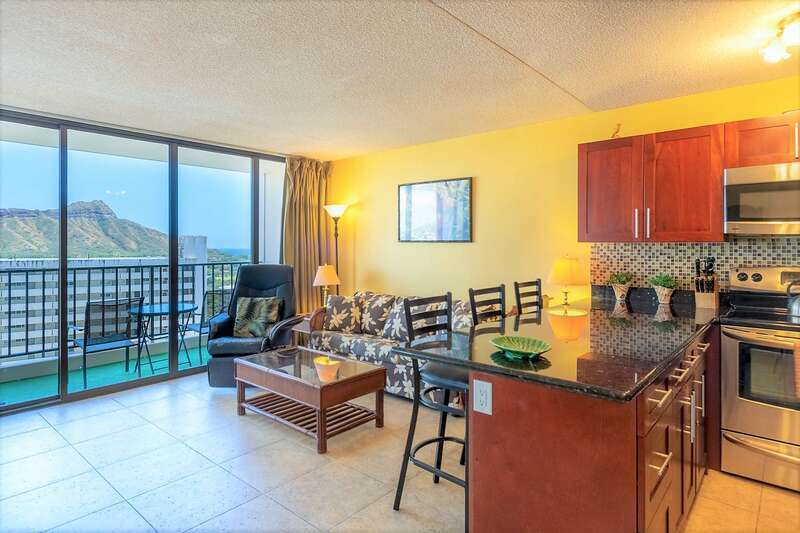 Tastefully decorated with contemporary furnishings, this condo is the place to relax and enjoy the best of Waikiki. 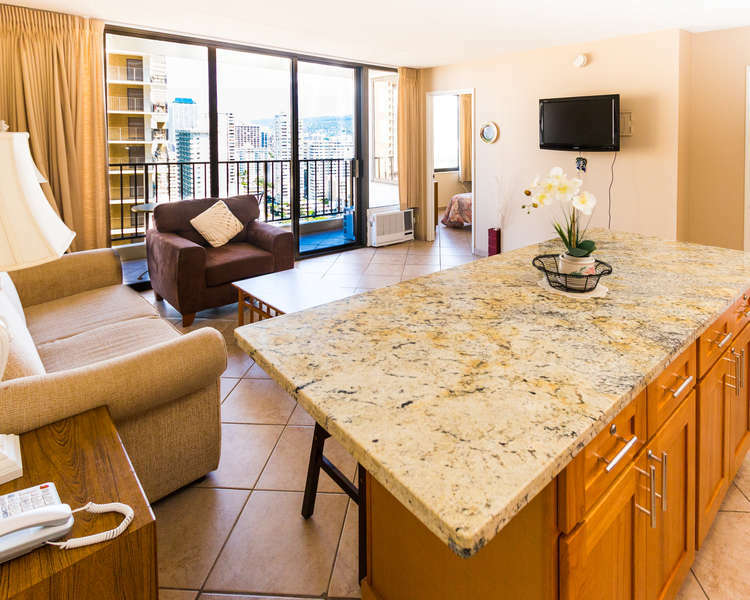 The condo is located on the 11th floor and has a beautiful view of the ocean beach and Waikiki City! Spend time on the lanai (balcony) or lounge at the rooftop sundeck and pool. Head down to the beautiful park with a walking path at Magic Island for a sweeping view of Diamond Head. The world-famous Waikiki Beach is only minutes away. Children might enjoy exploring the Waikiki Aquarium, Waikiki Zoo, or the Hawaii Children's Discovery Center – each 2 miles away. Convenient sleeping arrangements include 2 king size beds. Updated full bathroom with granite counters. Parking on site is available for a fee. Save money and enjoy the convenience of a kitchenette. The kitchenette includes a refrigerator, microwave, rice maker, coffee maker, and other kitchen wares. The room includes a Large Screen TV and FREE WiFi for your electronic devices. Koko Resorts at the Aqua Palms is the perfect location for your anniversary, family vacation, or to just relax and enjoy paradise! 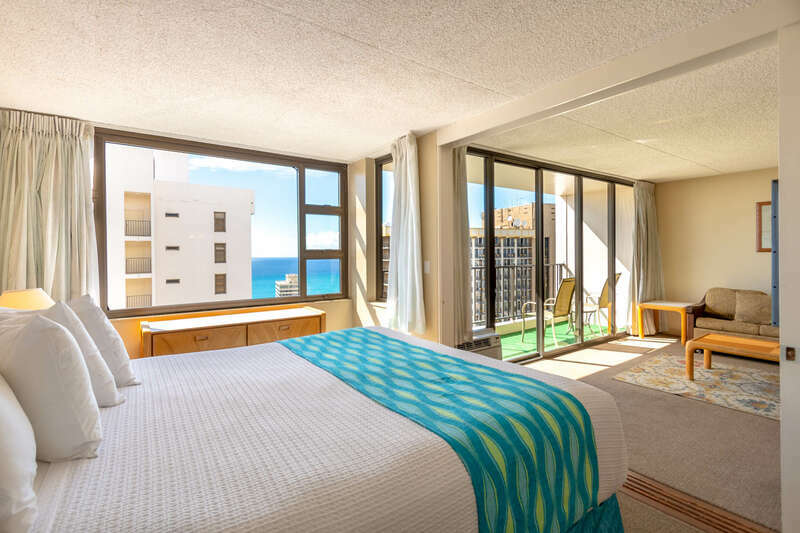 This building is conveniently located near Kahanamoku Beach, restaurants, specialty shops at the Ala Moana Center, Hawaii Convention Center, and other tourist attractions. The Aqua Palms has covered parking and a recreation deck which is equipped with a swimming pool and exercise room. If you stay with us during any fireworks displays, they are easily visible from nearby Magic Island. The upscale lobby at The Aqua Palms will welcome you back from a fun-filled day on vacation. There is also a restaurant and business center on site for your convenience. Koko Resorts saves you money with standard amenities like FREE WiFi internet and FREE local and toll-free phone calling. Please note the actual bedding configuration prior to booking to ensure the proper bedding. Maximum occupancy or the number indicated that a suite sleeps may not always be the same as the number of guests that a suite can sleep in a traditional bed. Folding cribs are available for rent at $10 per night with advanced request. For your convenience, Koko Resorts provides laundry detergent under the bathroom sink and coin-operated laundry machines are available on site. Tidy clean maid service is available at $35 per service. In case of the unexpected, Koko Resorts offers 24-hour emergency guest assistance – it’s just a phone call away.